Did Charlie Sheen go to San Diego State? He must have. At least for a semester or two. Or maybe he just attended a few parties. There has to be some sort of connection. In case you missed it – highly unlikely due to the enormous sample size – the Aztecs have been “winning” a lot lately. How much, you ask? Try nine conference championships so far this school year. That’s right. Nine. The most ever in school history. And we aren’t even done yet. San Diego State owns the Mountain West. Women’s soccer (twice), women’s volleyball, football, women’s indoor track and field, women’s swimming and diving, women’s basketball, women’s tennis and men’s tennis. All of these teams, whether in the regular season or the conference tournament, are Mountain West champions. Nobody else comes near that number. The next closest school? New Mexico (surprising, I know) with a mediocre five conference championships. Two of those – men’s track and field and cross country – came in sports that we don’t even compete in! 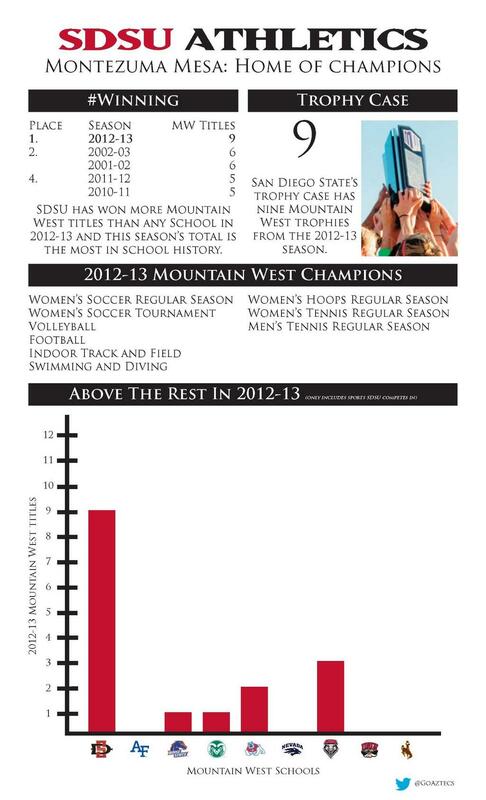 Not only have the Aztecs’ won nine titles so far, but there are still several chances for more. Odds are, at least one more crown will be locked up by the time the 2012-13 academic year is complete. Both the men’s and women’s tennis teams still have their conference tournaments left. The men’s and women’s golf teams are also gearing up for their conference tournaments. The women’s outdoor track and field team still has its conference tournament as well. The softball team still has a shot at the regular season title (no conference tournament). Although it would take some late-season heroics, the baseball team could still make a push for a trophy of its own. Additionally, the women’s water polo team, a member of the Big West Conference, is ranked No. 8 in the country and could potentially take home its own hardware in its conference tournament. The women’s lacrosse team, a member of the Mountain Pacific Sports Federation, could qualify for a spot in its postseason tournament with a win over USC on Saturday. To make a long story short, San Diego State wins. A lot. Hop on the bandwagon while there’s still room. Last week, we showed the residents of Boston they were in our thoughts and prayers by using a trending hashtag on Twitter. While we continue to pray for the recovery of the city of Boston, lets take over Twitter again. This time, let’s make sure everybody knows who the Aztecs are. 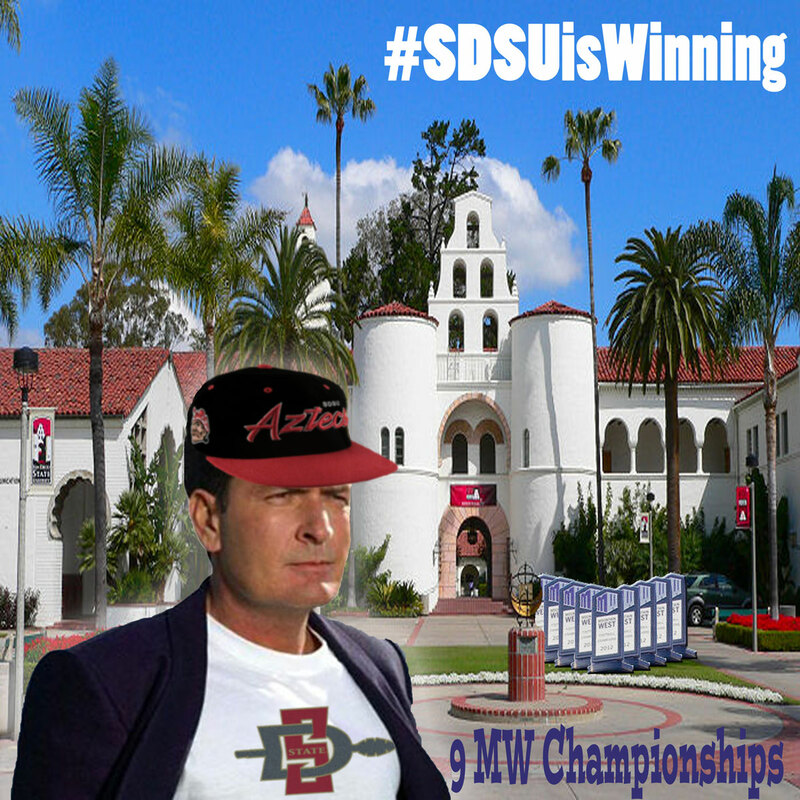 Get on Twitter and tweet something about the best school in the world, and follow it up with the hashtag #SDSUisWinning. Or, log in to Instagram and repost the Charlie Sheen photo with the same hashtag. Maybe even set it as your profile picture on Facebook. Post a link to this story to inform people of our winning ways. Whatever you do, just make sure you let others know about the Red and Black.